You probably have a hectic day ahead with an array of meetings lined up at work, and you wake up with a stiff neck that threatens to thwart all your preparation and plans. We’ve all been there and done that, but the important question is: What causes a stiff neck and what can one do to prevent it from recurring? A stiff neck can be extremely painful and debilitating. It can prevent you from turning your head without experiencing sharp pain, and the constant discomfort can make it nearly impossible to concentrate on the tasks at hand. In some cases, the pain may even extend to one or both shoulders and cause a lingering headache. While is it most commonly caused by a strained muscle, this condition can also be due to excessive stress. At times, it can even be an early indicator of a severe spinal disorder. If you find yourself thinking of drudging through the day despite the strain, think again! 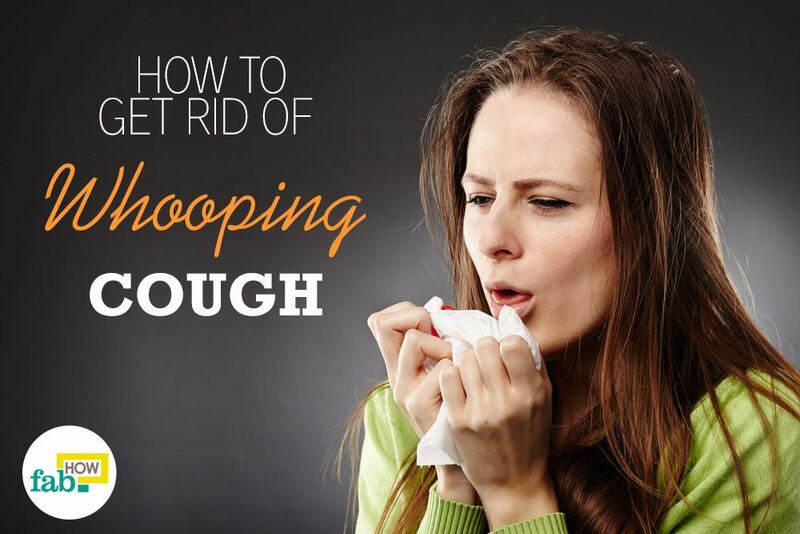 Doing so will only exacerbate the condition and cause you to miss even more work days. You need to take care of yourself and avoid strenuous activities and any jerking or sudden action involving the head and neck region. Continue reading to find out the causes and symptoms of a stiff neck, along with preventive measures, exercises, and home remedies to fix it. Incorrect or awkward sleeping position. Tension from extreme stress and anxiety. A stiff neck is characterized by a sharp, tingling pain in the neck that worsens whenever you try to turn your head. It can last for a day or more if left untreated and can keep recurring in the face of constant stress and strain. Practice good posture. Do not slouch. Avoid using pillows that are too high or hard. Instead, go for a feather pillow that easily conforms to the shape of your neck. Use a horseshoe-shaped pillow while traveling or even when you are reclining to watch TV. It keeps your head in position and prevents it from dropping to one side in case you doze off. Get a good night’s sleep of at least 7 to 8 hours, as lack of rest also contributes to muscle pain and strain. If you’ve frequently been dealing with a stiff neck, you should take it as a wake-up call from your body telling you to reduce your load and take things a little easier. You should also consult a doctor to check whether your stiff neck is being caused by a spinal condition and get proper treatment if needed. However, if it is occasional, all you have to do is rest and use any one of the following home remedies and exercises to fix a stiff neck. While you need to be extremely careful regarding your movements when you have a stiff neck, doing some light and simple neck exercises can relax and refresh your muscles, along with your strained cervical tendons. Follow the instructions below to perform an incredibly simple and effective set of exercises that will provide relief from a stiff neck. Regular exercise and stretching program prove effective in decreasing pain in neck and shoulder. Slowly nod your head forward and backward at least 15 to 20 times. Then, nod your head sideways to the left and right, an equal number of times on both sides. Once you feel that your muscles are loosening up, turn your head completely to your right and then to your left. Take it slow and easy, as it may hurt. Repeat the exercise at least 20 times and then rest. Perform this set every 3 to 4 hours to get relief from a stiff neck. If the stiffness is on the left side of your neck, take a deep breath and tilt your head to the right until your right ear touches your right shoulder. If the problem is on the right side, simply reverse the direction. Breathe deeply, rotate your head and look down toward the center of your chest. Repeat this exercise every 2 to 3 hours throughout the day to get relief from a stiff neck. Heat therapy will ease out the tension from your muscles and let them relax. This will slowly alleviate the stiffness in your neck and restore mobility. To this end, you can make your own warm compress and apply it on your sore neck. Note: Do not use a warm compress for stiffness caused by a fresh injury. Heat a rice compress in the microwave for 1 to 2 minutes. You can make your own rice compress. You don’t have to buy one. 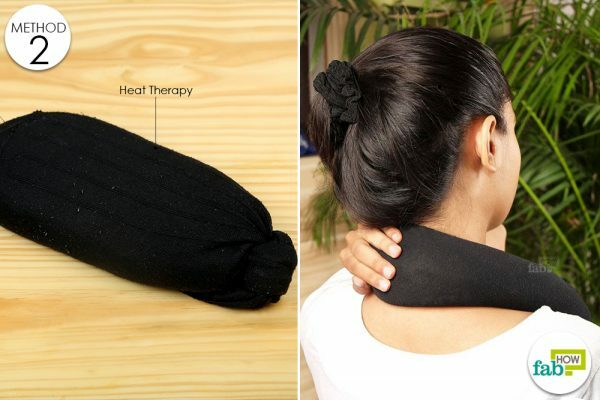 Place the warm compress on your neck for 15 minutes at a time. Make certain that the rice is not excessively hot to cause burns to your skin. Microwave times will vary significantly depending on your microwave. If you are uncertain about the power of your microwave, heat the rice in the microwave in 20-30 second increments until the rice compress has the desired warmth. Do this 4 times throughout the day to get relief. You’ve probably soaked in an Epsom salt bath from time to time for your overall health, but did you know that an Epsom salt soak can also help you to fix a stiff neck? 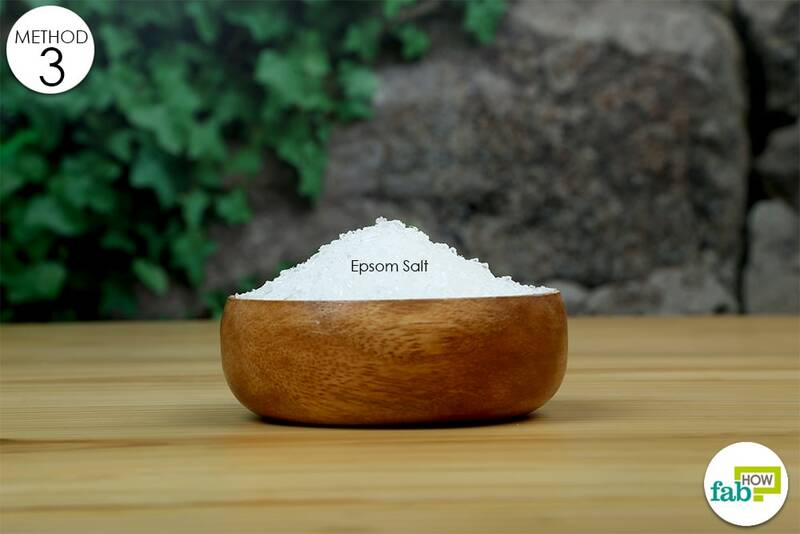 Even though it is called salt, Epsom salt is actually magnesium sulfate, a naturally occurring mineral. It is easily absorbed through the skin and will improve blood circulation in the neck, thereby relaxing the strained muscles and reducing tension. Add 2 cups of Epsom salt and mix it until it dissolves. Soak in the warm bath for 15 to 20 minutes. Make sure that your neck is submerged. Repeat twice a week until you get relief from the stiffness in your neck. Raw, unfiltered apple cider vinegar can truly be called a health elixir, as it can be used to treat a wide variety of internal and external conditions. As far as a stiff neck is concerned, applying apple cider vinegar to the strained area can help relax the muscles and provide quick relief. 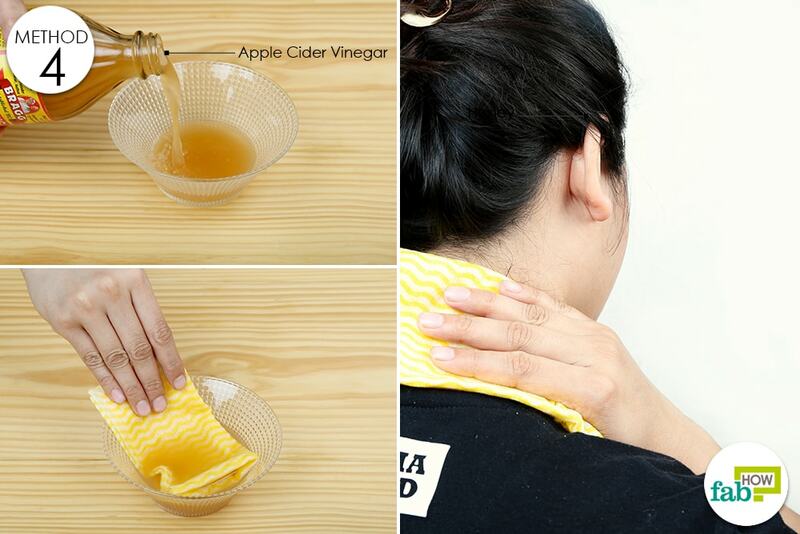 Soak a paper towel in raw, unfiltered apple cider vinegar and wring out the excess liquid. Apply it on your stiff neck and leave it for a couple of hours. 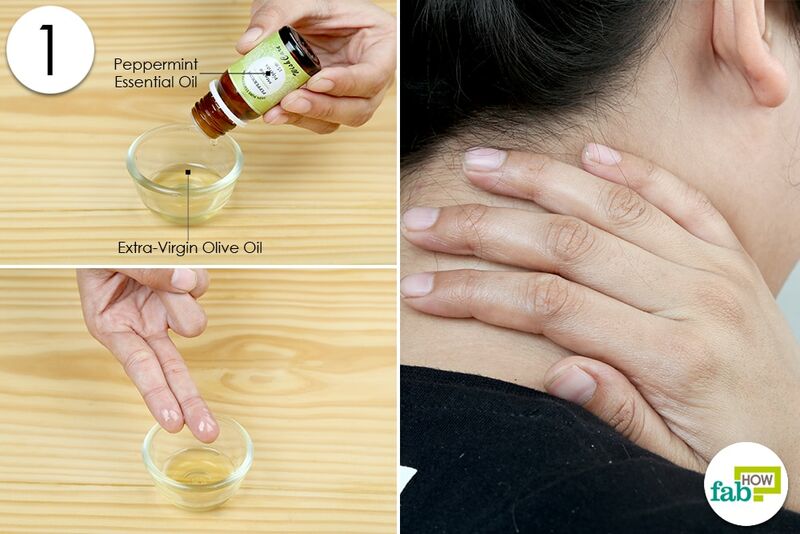 Repeat twice daily until you find relief from a stiff neck. Alternatively, you can add 2 cups of apple cider vinegar to a warm bath and soak in it for 20 to 30 minutes. Ensure that your neck is completely submerged. Turmeric has often been called the “queen of spices.” From spicy curries to natural remedies for ailments like psoriasis, arthritis and the common cold, this spice has a wide variety of uses and health benefits. The active compound in turmeric is curcumin, which gives this spice its characteristic yellow color and also endows it with anti-inflammatory and healing properties. 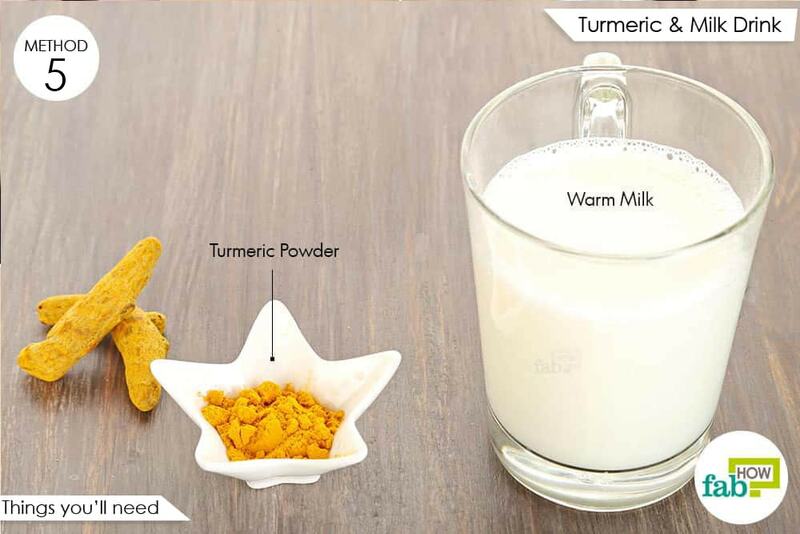 If you’ve been suffering from regular stiffness and pain in your neck, all you have to do is follow the instructions below to make highly beneficial and nutritious turmeric milk and let it heal your body from within. Heat 1 glass of milk in a microwave or pan. Stir to mix the powder in well. 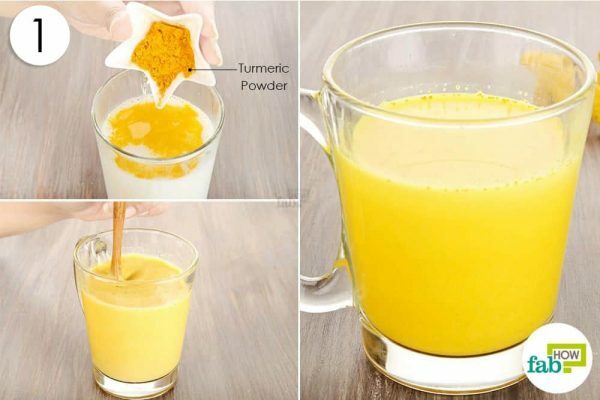 Continue drinking turmeric milk twice daily for at least 1 to 2 weeks, or until the pain and stiffness are gone entirely. When it comes to dealing with stiffness or pain in the neck, nothing can be better than a massage. However, not just any type of massage will do. You need to pick the right ingredients as well. Peppermint essential oil has incredibly potent anti-inflammatory properties that work to relax your tense muscles. Yet, as it is a powerful oil, you will need to dilute it in a carrier oil like extra-virgin olive oil that is easily absorbed into the skin. Caution: Since essential oils can irritate sensitive skin, do a patch test before applying the oil blend. You may experience a sharp, cooling sensation that is completely normal. However, wash off the blend if it starts to sting unbearably. Warm up 1 teaspoon of extra-virgin olive oil in the microwave for 30 seconds. If it’s too hot, it will diminish the efficacy of the essential oil. 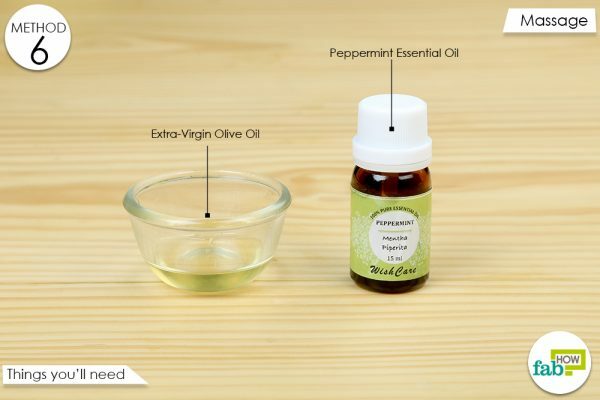 Add 2 or 3 drops of peppermint essential oil to the warm olive oil and mix well. Massage the oil blend into the stiff area in gentle, circular motions. Do this twice daily until the pain and soreness are gone. The world will end either in fire or ice and so will your neck pain. If you do not find relief using a warm compress, we suggest that you make a cold compress and apply it to the affected area. A cold compress is ideal for a stiff neck caused by an injury, as it constricts the blood vessels and numbs the area to provide pain relief. We’ve used a ziplock bag and some ice cubes. 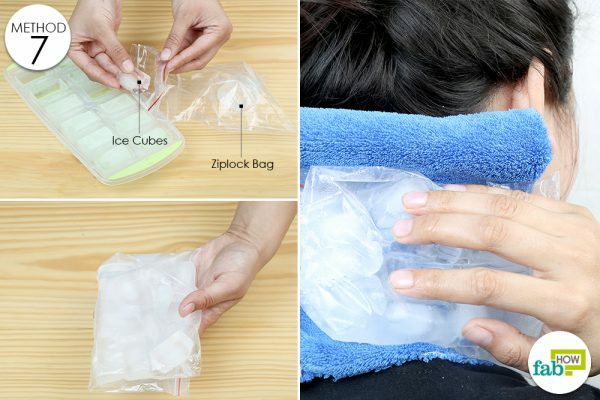 You can also use a bag of frozen peas or a gel-based cold compress that easily conforms to the shape of your neck. Caution: Never apply a cold compress directly on your skin. Always place a towel in between to absorb the moisture and prevent frostbite. Put at least 7 or 8 ice cubes inside a ziplock bag and seal it shut. Place a folded hand towel over the affected area, then put the ice pack on top. Do this once every 3 hours, and you will feel some relief after each session. Cayenne peppers are some of the fieriest peppers on Earth. All that heat comes from the main compound capsaicin that acts as an analgesic. The peppers have potent anti-inflammatory properties as well. 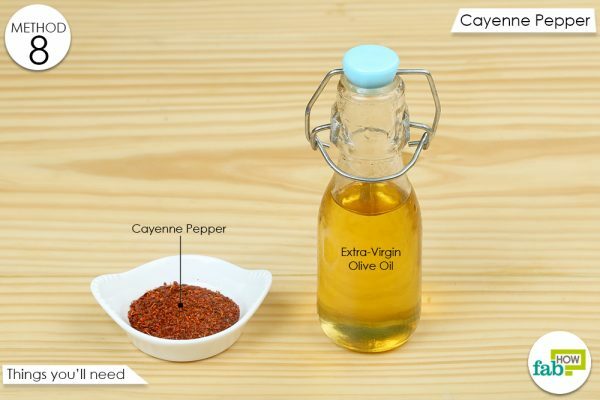 You can also use cayenne pepper powder to get relief from a stiff neck. Capsaicin also increases blood circulation in the affected area, which will help relax and heal your strained muscles. 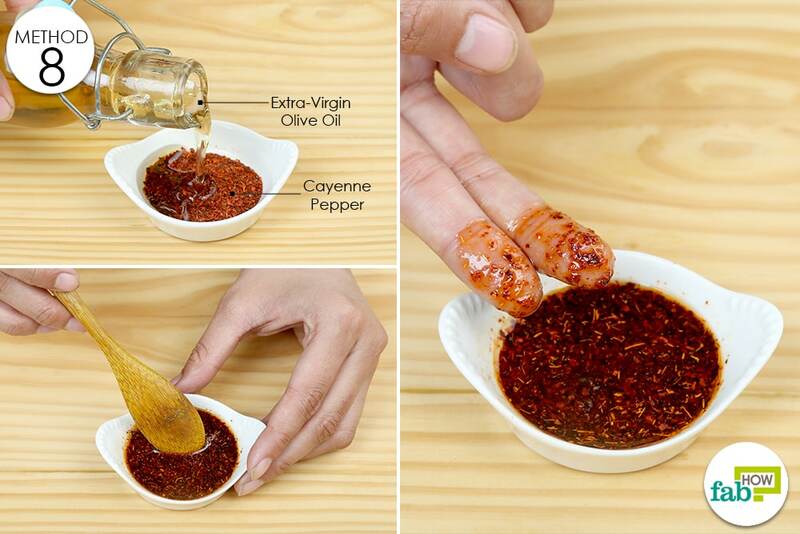 Mix 1 teaspoon of organic cayenne pepper powder with just enough extra-virgin olive oil to make a loose paste. Apply this blend twice daily until your pain and stiffness are gone. If your stiff neck persists for a week or longer, consult your doctor as it can be indicative of a serious problem. If you have a spinal cord, vertebra (backbones), disc, or spinal nerve condition, speak with a licensed healthcare provider before performing any neck exercises or stretches. You can also rub some muscle salve on the affected area for pain relief. If you want, you can learn how to whip up some homemade sore muscle salves. Drink 8 to 10 glasses of water a day to stay hydrated, as your spinal discs need water to maintain standard disc height. Avoid cradling your phone in your neck while talking. Instead, stop what you’re doing and hold your phone in your hand to take important calls. Also, do not keep looking down to browse through your phone all day, as it puts a strain on your neck.